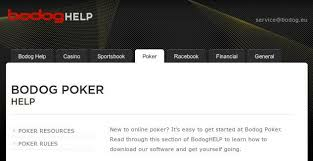 In those early days of online poker, there were the behemoth sites such as PartyPoker, PokerStars and Full Tilt Poker, but there was also Bodog, the site founded by Canadian entrepreneur Calvin Ayre. Bodog wasn't just poker - the company quickly expanded into music, media and even coffee! They were hit like other poker sites on "Black Friday", but have since grabbed back their share of the market, and, unlike the big three, offer poker opportunities to American players via their Bovada poker room, which is designed especially for North American poker fans. This review is for the main Bodog site that's open for players outside the United States. Although Bodog don't seem keen to publicise it, there is a version of the Bodog poker client for Mac. If you're a Mac user and you want to use the Mac client, then just visit the Windows downloads page. You'll have to hunt for the link on the page - it's right at the bottom: "If you are a Mac user, visit the Mac download page." Linux users are also okay at Bodog as the client runs perfectly under Wine. The initial download is small, as ever, but that is just the installation program itself. Once you have downloaded it, click it to get it to run then the program will quickly download and install the main poker client. Once the client itself starts up you can sign up at Bodog by click on the large red "Join Now" button on the left of the client. You will need to fill in your usual details at this stage. Oddly, every nation I tried in the Bodog registration field seemed to fail - even countries where online gambling is perfectly acceptible, such as the United Kingdom, failed. The only country that seemed to be okay was Canada, so I contacted a Canadian friend I had to complete the registration process for me. You're entitled to a nice $1,000 bonus at Bodog when you sign up, as a first deposit bonus worth 100 percent - so you'll need to deposit $1,000 in order to obtain it. You release this bonus by earning Poker Points when you play for real money at the tables. You have sixty days from when you make your initial deposit to release as much of your bonus as you can. The bonus is released in six stages, in steps of $10, $40, $100, $150, $300 and $400. You will need to earn a total of 10,000 Poker Points in order to clear the whole bonus. You earn 3 points for every $1 you spend in tournament fees at Bodog, and around one point for every $1 of rake you generate. I do like the Bodog poker client. It's big and is not filled with unwanted adverts - just a couple of nicely unobtrusive ones in the side panel. Game selection is done by ticking the appropriate boxes on the top of the screen. The default setting is to show everything, but within a couple of clicks you can filter out everything that you're not interested in. All your account details are shown to the left of the screen, and you can make deposits easily. In summary, the Bodog poker client is certainly up there with the best of them. Heads-ups through to Multi-Table. Buy-ins: $1 + $0.10 to $200 + $15. I had been granted $2,000 in Play Money chips when I joined, so I decided to make full use of them before I make the decision to make a deposit. I found a 6max SnG and registered. I was only the second player to register, but the table filled up nice and quickly. The table client has a sort of futuristic look that I assume with appeal to some people, but it didn't appeal to me. The controls were a little wanting as well, as pre-flop you could only call, double or raise to half the pot or the size of the pot - There should always be buttons based on the size of the blinds when you're betting before the flop. You could set any amount to bet, but only by using a slider, which I personally do not like. 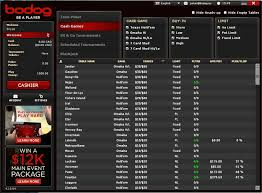 Many poker table clients allow full configuration, but I couldn't find that option at Bodog. There were another couple of features I didn't like - all players are anonynmous, and there's the "Rabbit Cam" which allowed you a sneak peak at the next card to be dealt if a hand completes before showdown. At present, Bodog is only really open to players from Canada. Aside from the First Deposit Bonus, Bodog runs a continous stream of promotions, including weekly freerolls and qualifiers for WSoP events. Bodog also runs a casino, so you are also offer incentives to become a casino player, including using the mobile casino. There does not seem to be a VIP scheme as such at the poker room, but you still accrue Poker Points once your initial 60 days is up, and you can spend those points on tournament entries where there are genuine cash payouts. There is not a dedicated mobile client, but you can use Bodog poker on your mobile device by visiting the Bodog site, although saying that I could not get it to work on my Android tablet. Like its sister site Bovada, Bodog really does need to step up a gear or two when it comes to help and support. There is a telephone number you can call, and an email address you can use, but it would be nicer if support was a little speedier than the four hours that the site promises to answer emails within. I like the design of Bodog Poker, but it's a bit pecular that even though the site's domain name ends in "eu" it only seems to welcome Canadian players - indeed one of the site's biggest promotions when I wrote this review was for a Canadian poker event. Perhaps Bodog expects to expand into the European market eventually. It's a shame that European players cannot make use of that bonus and the other promotions currently. There's something nice and contemporary about Bodog - let's hope they expand their borders beyond North America soon.